Every night at my office the Day End Reports print. It is a hefty stack of reports relating information about the day's activity to be distributed to various people in the company. 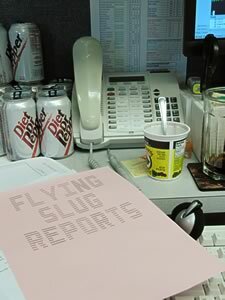 Each segment in the report has a pink title page printed in-between so it is easy for us to hand out the reports to various people (good 'ole ANSI/ASCII art). A couple days ago two of my co-workers in the data processing/IT department were going back and forth about whether the title pages should read the name of the people they go to or the actual titles of the positions of the people. The reason being, if someone quits or changes to another position within the company, we wouldn't have to change the title pages if we gave them titles, rather than people's names.